DON’T MISS BOBBY MCFERRIN at the NCH Wed 6th & Thurs 7th March! 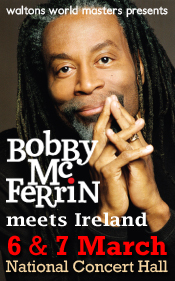 Tickets still available (from €36)for Bobby McFerrin Meets Ireland at the National Concert Hall, Dublin on the 6th and 7th March. A ten-time Grammy Award winner, Bobby McFerrin is known for music-making that transcends the boundaries of language, culture and genre. He has inspired audiences around the world with his legendary solo vocal concerts and collaborations with artists ranging from YoYo Ma and the Vienna Philharmonic to Ladysmith Black Mambazo, Chick Corea and Taj Mahal.